Skin hydration is very important! 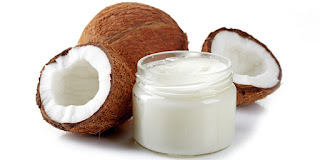 The differences between coconut oil and caprylic/capric triglycerides can be confusing. Our most popular oil treatment, Nangai Oil, oftens begs for this question to be answered. Fractionated coconut oil is created by melting coconut oil and then letting it cool very slowly. The different kinds of fat in the oil separate based on their different melting points. This is a physical separation process, i.e. not a chemical reaction. It typically refers to the liquid portion of the coconut oil that has been separated from the harder fats. Triglycerides are made up of 2 components: glycerin and fatty acids. Fatty acids are chains of carbon and hydrogen, which vary in length. In a fat, the glycerol group holds three fatty acids together. Caprylic/capric acids are saturated fatty acids naturally present in coconut oil. To isolate the triglycerides from coconut oil, separation by steam hydrolysis of the fatty acids from the glycerol group is required. Intense heat and pressure is applied to break apart the triglyceride molecule. After, the oil goes through another process to add the glycerol group back to the fatty acids. These processes create a purified oil which feels less greasy, is highly stable and absorbs quickly into the skin. It does however, have the tendency to solidify at low temperatures. Nangai Oil is unique because it does not require any chemical process to extract the triglycerides, unlike coconut oil. Pure caprylic/capric triglycerides are naturally present in Nangai Oil and do not require any processing to create the pure, beneficial product. All the triglycerides present in Nangai Oil are natural. These natural triglycerides form a barrier on skin that stops water from evaporating, and, at the same time, it does not feel greasy or heavy. So interesting to learn about the differences! LAST CHANCE for August Sign Up Offer! The Uses of Nangai Oil! All About: EyeSense Liquid Eye Liner! Picking the Right LipSense Upline!